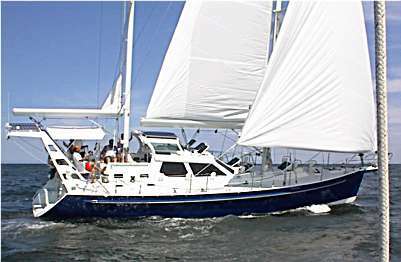 "Sabbatical" was designed for Ann and Scott Ripley of Virginia, USA, as a robust go-anywhere cruiser to a very comprehensive design brief. By completion of the design, a very complete set of drawings detailed a yacht packed with interesting features. By that stage we had never met, nor even spoken on the telephone. The whole process took place across 6000 miles by mail, fax and email. Much of the first part of her life will be spent in the US Intra Coastal Waterway so her rig height has been set to allow her to fit under the fixed bridges. To maintain sufficient sail area for good performance, the mizzen has been made tall. Her headsails comprise a light genoa on the outer furler, a working jib on the inner furler and a storm jib on a removable inner forestay. Main and mizzen are on in-boom furlers. Most sail controls are led to a pair of electric primaries or an electric halliard winch on the cabintop. Later in life she is to be used for extended cruising so no effort has been spared in making her a comfortable home on the sea, with space for almost every conceivable luxury. Her cockpit is set on top of the deck, rather than recessed into it, giving her unimpeded headroom aft. Her arch aft acts as a bumkin to extend the rig base along with the bowsprit. It also incorporates davits and a mounting surface for some of her solar panels, the others being on top of her hard dodger. The dodger has removable panels to front and sides for airflow. Between the legs of the arch, she has a pair of gimballed chairs separated by a shaped helm seat which incorporates storage for the liferaft. 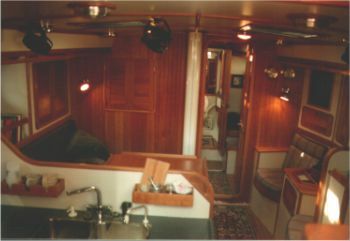 Down below she has a pilothouse with inside steering and two settee berths on the upper level. 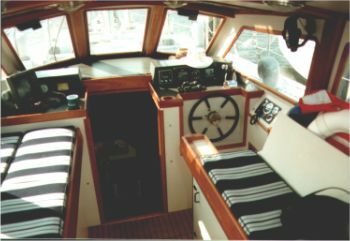 The seats have backrests for comfortable sitting but they fold down to increase the width for comfortable sleeping.The pilothouse can be isolated from the lower level with a conventional companion hatch and washboard arrangement for security in harbour and safety at sea. The lower level has very comfortable accommodation in three cabins. The saloon is intentionally compact because the pilothouse will take away some of the pressures from it in use. It can dine 7 if the table is folded out to allow the easy chairs to be used as well. She has a walk-in engine room, giving good access to all of the machinery and ancilliaries. Also in this area is a 1.5m long workbench with storage lockers. Construction is round bilge aluminium using longitudinals over widely spaced frames. CAD frame patterns or info for computer cutting of the frames can be supplied if required, including nesting of frame components. These are optional extras so please contact us for the cost. Tankage is integral, with 1075 litres water and 1850 litres fuel. Her displacement is moderate to allow her to carry a good load of equipment without problem. Her long waterline helps her to carry this load with good speed. "Sabbatical" would be a good selection for a cruising couple or family who want to go anywhere they choose, in comfort. Follow these links to a stability curve, material list and a list of drawings for this design. Testimonial from F. Scott Ripley - Owner of "Sabbatical", while under construction at Global Yachts, Norfolk VA.
"It is hard to believe that the boat is finally under construction. There are about 15 men working in the yard and one can really feel the enthusiasm. I have never seen Howdy so excited. Howdy and his workers are marvelling over the detail of your mylars. Howdy said again yesterday that this boat is going together the smoothest of any that he has ever built." This design is in metric with dimensions in both metric and inches.